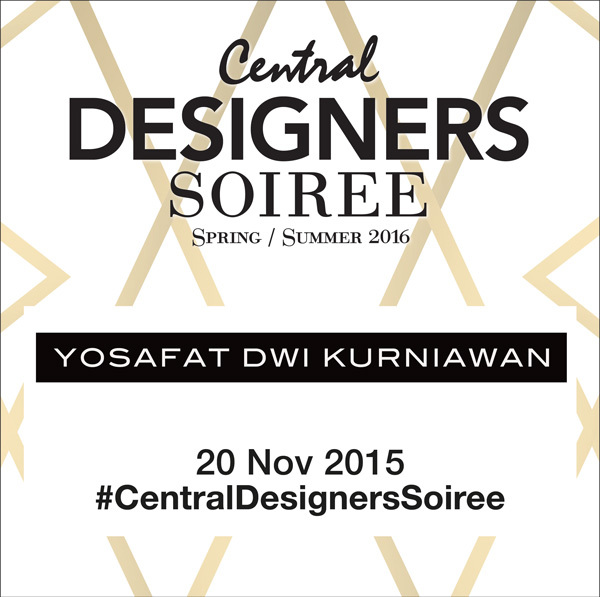 For Spring 2016, designer Yosafat Dwi Kurniawan is launching a collection based on the stories of the fallen kingdoms. The designer started the research with Kraton Jogjakarta. Deriving inspiration of the many relics and pinctures founded in the Kraton and museums, the designer was inspired to create the extensive beading that is meant to resemble batik but imagined to be made from armor. Each bead is sewn in one by one, in differennt shades of gold and metallic, so extensively that a jacket can take up to a month just to bead. The research took a the designer to China. Upon a trip to Taiwan, he discovered a lot of stories about Empress Dowager Cixi, a villain in the history of Imperial China, who enjoyed the lavish things in life. She once rumored to have her room in the Forbidden City to be painted gold, and while the story can never be confirmed, the idea of painting gold with a brush is applied in the collection by using the techniques of gold foiling. The extensive and ornate matter of the theme also materialized in the use of snakeskin, in which this season, the designer opted for phyton and cobra. Heavy flower ruffle detail is also another thing to explore in this collection, where each outfit may take up to 20 meters of chiffon to make the ruffles, and in each single flower, the center is beaded with gold sequin.